Azteca Stadium in Mexico City was deemed unfit for an NFL game in its current condition. MEXICO CITY — The NFL’s decision to move the regular-season game between the Kansas City Chiefs and Los Angeles Rams due to the poor condition of the turf at Azteca Stadium has left many Mexicans disappointed, angered and wondering how it will affect the country’s future relationship with the league. After consulting with the players association and local officials, the NFL determined the conditions of the venue did not meet the standards for playability and moved the game back to the Los Angeles Coliseum. The Rams (9-1) and Chiefs (9-1) will face off Monday night in a much-anticipated game between the top two teams in each conference. The stadium also hosted two concerts by Colombian singer Shakira on Oct. 11 and 12, and another from music channel Telehit on Nov. 7 that left the field in its worst condition in years. According to an NFL study released last year, the game between the Oakland Raiders and the Houston Texans played in 2016 generated a $45 million impact on the local economy. The Mexican government said that last year’s game between the Raiders and the New England Patriots topped that number. The game is usually scheduled on the third weekend of November, when Mexicans celebrate the Revolution’s anniversary, and the authorities organize additional activities in order to entice fans to spend the entire weekend in the capital. For this year’s game, the fan-fest that drew more than 300,000 fans in Chapultepec Park was moved to the Zocalo, the country’s main square located in downtown Mexico City, in an attempt to draw even more fans. The NFL office in Mexico and the Sports Institute of Mexico City also scheduled 5k and 10k races for Sunday. Local authorities have not said whether those events will continue. “I’m very upset because I already purchased my plane tickets and they canceled the game at the last minute. They promised to reimburse my money for the game ticket, but what about the other expenses, who is going to be held accountable for that?” said Víctor Reynoso, a Rams fan who was planning to come to the capital from the northern city of Monterrey. 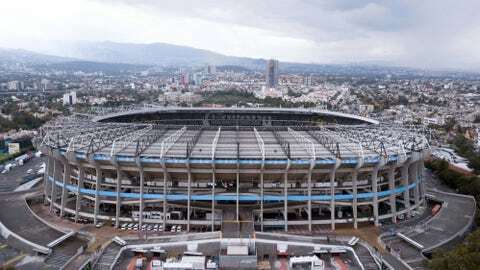 Reynoso is probably not alone, according to Mexico’s Tourism Secretary; around 30,000 fans typically visit the city for the weekend of the game. The federal government, through the Tourism Secretary, pays the NFL $14.5 million for each game. Last year, the NFL and Televisa, which owns Estadio Azteca, announced that they had signed an extension to bring back games until the 2021 season. But it’s uncertain what will happen after Televisa failed to present a field up to NFL standards. Several NFL owners are wary of additional games at Azteca, and while the league is still keen on playing games in Mexico, it might be ready to consider other venues there. Monterrey and Guadalajara have stadiums capable of hosting NFL games, and both cities will be hosting 2026 World Cup matches.